If you are into growing indoors or are seasoned growers, you must have known CMH grow lights - one of the modern light technologies that stir the interest of a number of hydroponic growers recently. But how much do you know about it? And which CMH products are the top quality and best suit your needs? I'll explore all about these in this guide. What are Ceramic Metal Halide grow lights? Actually, Ceramic Metal Halide (or CMH) grow lights are not new; they were first developed in the late 60s, and it's not until recently that they are acknowledged and used commonly as grow lights. Ceramic Metal Halide (CMH) or Light Emitting Ceramic (LEC) are two different terms, but both refer to the same technology. So basically, we can use these two interchangeably. In this article, I'll mostly use CMH. A CMH grow light is like a Metal Halide (MH) bulb, but while a MH bulb uses a standard quartz arc tube, CMH is built with a ceramic arc tube. This is similar to the material used for HPS grow lights. So that's can be said that CMH is a mix between MH and HPS. Since it uses ceramic arc material, CMH is less degradative than both MH and HPS with up to 20,000 hours of lifespan. CMHs can operate at a higher pressure and emit stronger light output than HIDs as well. This is the first winning point of CMH over HIDs light. CMH bulbs have much a wider and more consistent spectrum. So besides having enough light intensity, plants also love to have sufficient light colors/quality to have their best growth potential. Under high pressure, CMH bulbs can produce powerful light output that contains Ultraviolets (UV) like the sun. These UVs include UV-A, UV-B, UV-C, especially UV-B which is really helpful for plant growth, overall all 3 types of UV are harmful to human eyes. So you should not look at the bulbs directly for a long period. And most good CMH brands use a protective glass filter to block harmful UV types. Since they are built with ceramic arc tubes, CMH grow lights have a great lifespan of up to 20,000 hours. But reality shows that they can last longer than that. This is more than double the average lasting hours of HID (HPS and MH) bulbs. 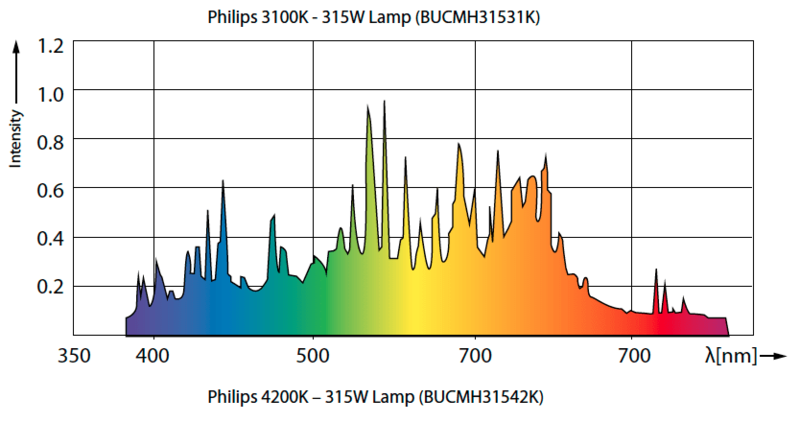 The initial cost of getting a CMH bulb/system might be more than other lights. But with better energy output and coupling with a longer lifespan, it can save you much in the long run. Nothing can replace HPS when growing plants in their flowering phase. This is because HPS vibrate more reddish & yellowish wavelengths at high intensity. These wavelengths are vital to boost plants to flower, produce fruits, and grow vigorously. Even though CMH bulbs do not manufacture much heat like the standard HID lights, they still give out lots of heat. So it's not really efficient for smaller growers with small space. So if you have a high wattage bulb running in a closed system, some ventilation methods must be done. CMH grow lights are not for those with a tight budget. Though CMHs are much cheaper than a quality LED lamp, you should be ready to spend at least $500 at the start. But what you'll have is a quality and durable grow lamp that can produce high yield and last you for years. CMH lamps are recommended for universal positioning. This means they can be positioned vertically or horizontally above the canopy. The position won't cause damage to the bulb. The position won't affect the light distribution, and every plant will have a consistent absorption rate. The grow light must be hanged minimum 3ft above the canopy to avoid any hot spots. This also provides an efficient and even light distribution. The light distribution is so intense that a bulb with 315W can have a coverage area up to 4ft x 4ft. This is larger than what higher wattages MH and HPS bulbs provide. An increase in the watts leads to a bigger coverage area. The higher watts contribute to greater heat produced. Make sure you hang the grow lights at least higher than 3ft above the plants to cancel out the effects of the heat. The table below shows the recommended coverage of each CMH bulb and the distance from plants you should keep. Despite depending on the type of bulb temperature you get, CMH grow lights all have very wide spectrum wavelengths. They produce high red, yellow and green color temperatures. Each color has its own role in promoting the plants through the different lifecycle stages. Red: This color is responsible for the flowering and fruiting of plants. This spectrum may need to be supplemented because CMH push plants through this stage well as HPS lamps. Yellow: This colored light spectrum improves the effects of photosynthesis. Green: This is used to elicit specific plant responses such as stomatal control, phototropism, photomorphogenic growth and, environmental signaling. CMH lamps don’t have high outputs of the blue spectrum like other 2700K bulb or blue LED lights on the market, which are great for veg stages. However, they do have sufficient blueish light colors to grow in the veg stages. Commonly, you'll run into two versions of CMH bulbs on the market. 4,200K (broader spectrum) bulb contains wide wavelengths but has more blueish wavelengths; So is more suitable to grow seedling and veg plants; They can be used to grow flowering phases, but the 3100K is more efficient. There are heated debates about which grow light technologies are better. Here we list all the differences between CMHs and other popular grow lights, including MHs, HPs, LEDs so that you can easy to understand. As you have seen from the table, CMHs beat MHs in every way, except the initial cost. But what you get from the investment is a more well-balanced bulb with broader spectrum, longer durability, and higher light intensity. In comparison with HPS, in a lot of tests done by growers, CMHs even have stronger PAR output than HPs at the same wattage, which proves more light efficiency. CMHs also have lower heat, longer spectrum, and more durability. The only situation, HPs are more efficient is when you grow plants during their flowering phases. But the heat issue from HPs do irritate lots of indoor growers. So if you need only one bulb during the whole growth, I would recommend CMH grow lights, they are a better all around grow light over HPS and MHs - produces well-balanced broader spectrums, high intensity and can last longer. LEDs do have their stand compared with CMHs with a longer lifespan, lower heat, full spectrum. However, the large startup cost and the powerful light output and wavelengths make CMHs still favored by either small and seasoned growers. LEDs can last to 5 years while a CMH lamp should be replaced after 4 heavy grows, or every 2-3 years. For the best results and security, I would recommend you buy a CMH kit. This way you don't have to worry if the ballast works with the CMH bulb or not. And a kit also comes with an already set-up reflector and glass that protects harmful light for human and keep the UVs that are helpful for plants. The Sun System LEC kit is really popular CMH product among indoor users. This is a really powerful CMH fixture; So really helpful for a small setup of about 4x4. It's recommended that you place the lamp 18" or more from the canopy not to burn or bleach the plants. It has a CRI of 92, which is closer to the sun (100 CRI). This fixture has a German aluminum insert and built-in thermal protection, which control the heat issue very well. The product is made in the USA and has a 1-year warranty, which is average for a CMH grow light. Overall, this is my go-to grow light for a CMH system. It is a product that has been proven by users with great USA-built quality, strong light output, and long durability. If you are on a budget, the CMH fixture from Grow Co is a great choice. It uses the quality 315W Phillips Master CMH, which is really strong and stable. It still has all the important components of a great CMH system that are ready to work once powered on. However, unlike the Sunsystem has a ballast inside the reflector, Growco ballast is placed externally. And personally, I find this doesn't make the fixture design look good. Also, it does not give a specific figure about the reflective aluminum. But this is not a concern to me or lots of growers. Lots of users have used this fixture and enjoyed good results with it. So really a good inexpensive CMH fixture to get. Included packages: daisy chain socket, 120V - 240V adapters, power cord. VIVOSUN is a manufacturer from China. They do not have a great reputation like the Sun System when it comes to CMH grow lights. But they try to compete with them by offering a good CMH system with a long warranty period and a great price. It uses the Italian VEGA Aluminum hoods that has a light reflectivity rating of 98%. The ballast, which uses the Square-Wave technology, is built inside the reflector, making the design of this product visually appealing. This product does not come with a bulb, so you should buy another bulb instead. So if you do care about a price, the VIVOSUN is a good CMH system to pick with a built-in ballast, VEGA Aluminum hoods, and a 3-year warranty. Philips is a popular manufacturer that sells a variety of bulbs from CFLs, MHs, HPs to CMHs. And they are trusted and favored by users because of its quality and durability. 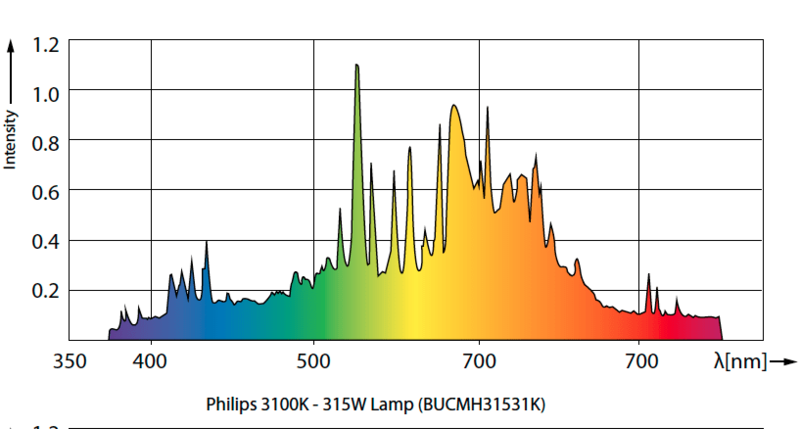 This CMH bulb from Phillip has the color temperature of 3100k. And there is an option for 4200K bulb temperature. For light output, it has a PPF of 1.95 per watt per second. The bulb has a 33,000-lumen output, and it's stated to retain nearly 30,000 Lumen after 8,000 hrs of performance still. The 3100K has a lifespan of 20,000 hours while the 4200K has a lifespan of 30,000 hours. So if you're a small grower, a 3100K bulb (a broad natural-light bulb) is enough for all plant stages. But if you really care about quality, you can get another 4200K bulb and use this for the veg phase, while the 3100K for the flowering period. Protopia has a much more affordable price for their CMH bulb compared to the Phillips. In a test done for PAR out of CMH bulbs by growers, it is shown that Protopia has a more PAR than Phillips. But that's the only winning point of Protopia. This bulb deteriorates faster with only 15,000 hours of lifespan. It also has a less CRI at 90. And like Phillips, it is available in 315W, 630W. Temperature is available in 3100 and 4200K. So this is still a great choice if you care much about the price difference, the light intensity, but bear in mind that you will replace the bulb faster than the Phillips CMH light. No doubt CMHs are efficient and durable grow lights that will bring great yield for your hydroponic gardens. So I hope this guide has shed some lights for you about this great technology and help you pick the suitable CMH systems or bulbs of your choice. To sum up, if you are looking for a quality CMH system, I would recommend the Sun System LEC for its popularity, great build and proven light efficiency. For single CMH bulb, get the Philips Master product. Though these bulbs are more expensive than other bulbs on the market, you get a longer durable bulb and more consistent light output that your plants love. I used mh/hps for yrs than used led for 4 yrs. I moved to cmh and it is a great balance between cost and efficiency. I use 2- 630w over 32 sq ft .
Spaced appropriately and always between 30 and 34 in. From the top of the canopy. Penetration through the 10 or 13 inch canopy is a big win. Money is saved on piwer due to less venting power over hps. Any cost saved on the venting difference between cmh and led is quickly realized in more robust yield from cmh. Thanks for pointing out. I fixed it. Yes, I agree with you. For us, non-seasoned growers, I think CMHs and LEDs are more comfortable to grow - cooler and more cost-effective regarding venting than HPs/MHs even though the initial cost to get quality a CMH or LED light is much higher.